Four variants of industrial quality, double door, freestanding cabinets with a range of internal shelving and drawer options. Easily assembled with minimal tools required. Durable, scuff resistant, adjustable shelving each with a weight limit of 150kg. Drawers run on heavy-duty ball bearing drawer slides with a load bearing of up to 75kg. Reinforced steel doors with zinc plated locking bars provide three point locking. Supplied with two coded keys. Ideal for home, office, garage or workshop use. 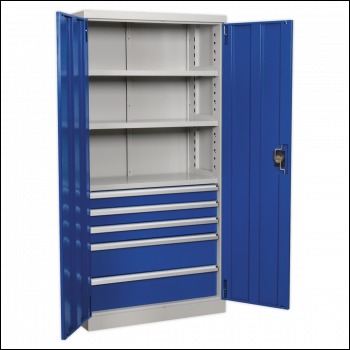 Industrial quality, double door, freestanding cabinet with three shelves and five drawers. Unit easy to assemble with minimal tools required. Durable, scuff resistant, adjustable shelves, each holding up to 150kg. Drawers run on heavy-duty ball bearing drawer slides with a load bearing of up to 75kg. Reinforced steel doors with zinc plated locking bars providing 3 point locking mechanism. Supplied with two coded keys. Overall Size (W x D x H): 900 x 450 x 1800mm.